Is France one nation? What makes it so? 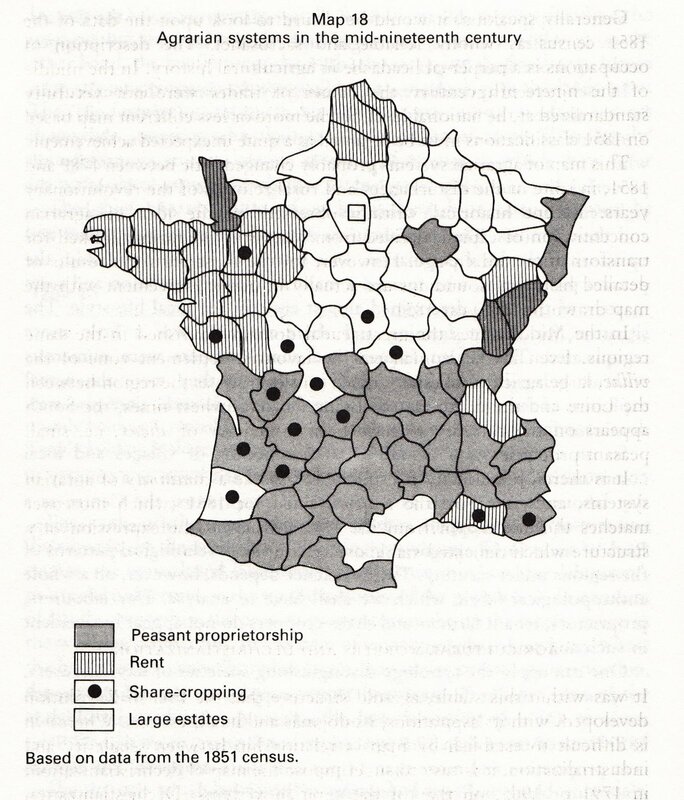 And what are the large socio-cultural factors that led to modern France? These are the questions that Emmanuel Todd raises in The Making of Modern France: Ideology, Politics and Culture . Todd is one of this generation’s leading historians in France, and his conception of the challenge of history is worth studying. I would call him a “macro-historian”, in that he is interested in large processes of change over extended stretches of space (for example, the extension of industry across the map of France from 1850 to 1970, or the patterns of religious dissent from the twelfth to the twentieth centuries), and he singles out characteristics of family structure, demography, literacy, and religion as a set of causal factors that explain the patterns of historical change that he uncovers. 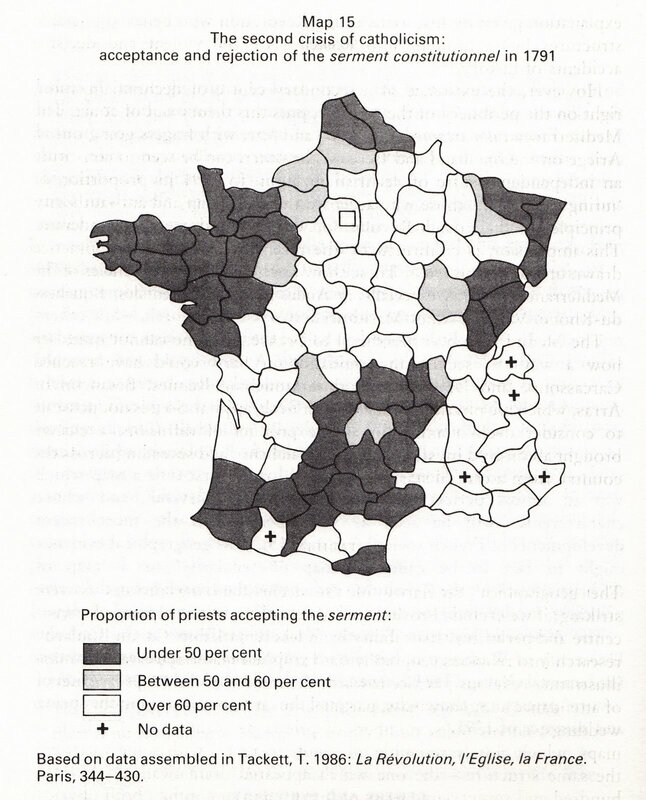 The central analytical device in Todd’s argument is a fascinating series of maps of France coding the 90 départements of France by such variables as the percent of women holding the baccalauréat, the percentage of priests accepting the serment constitutionnel (revolutionary loyalty oath) in 1791, or the percentage of workers in a given industrial sector. The maps display striking geographical patterns documenting Todd’s interpretation of the large historical patterns and their underlying anthropological and geographical causes. 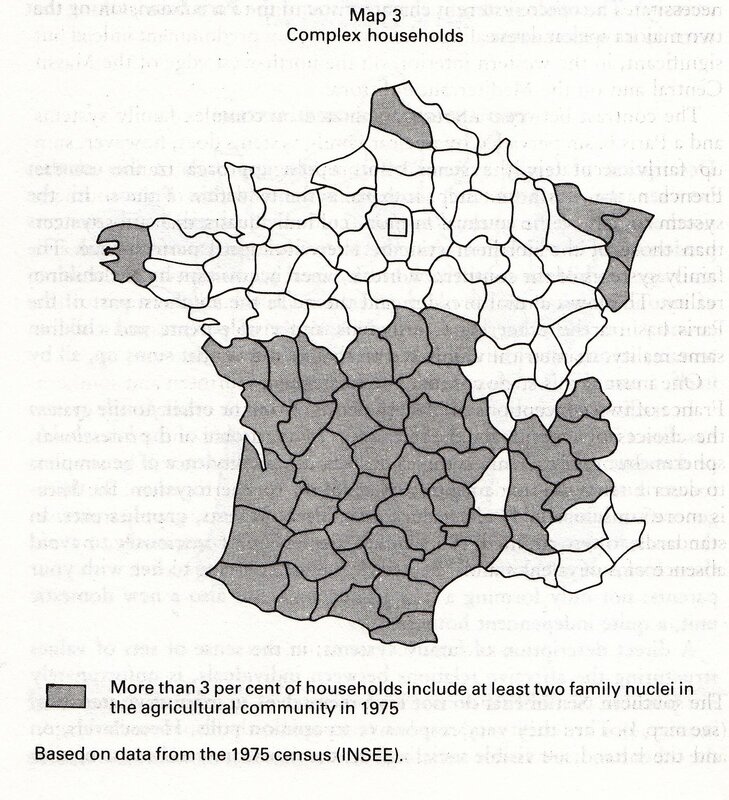 At the largest scale, he argues for three axes of historical causation: a north-south axis defined by family structure that creates differentials of literacy and population growth; an east-west axis defined by the diffusion of industry from northern Europe into eastern France and across the map from east to west; and a political pattern different from both of these, extending from Paris at the political center to the periphery in all directions. The following is a great example; Todd is interested in observing the degree of “religiosity” across France around the time of the Revolution, and he uses the percentage of priests who accepted the oath of allegiance demanded by the Revolutionary government as a measure. The resulting map reveals conspicuous patterns; the periphery and the south stand out as non-conformist. Todd also argues that there is a causal order among the large social factors he singles out. Family structure is causally relevant to literacy and education level; literacy is relevant to religious dissent and the emergence of Cathars, Waldensians, and Protestants; family structure is relevant to reproductive rates which are in turn relevant to the spread of industry; and traditions of inheritance are relevant to a region’s receptiveness to the ideology of the Revolution. 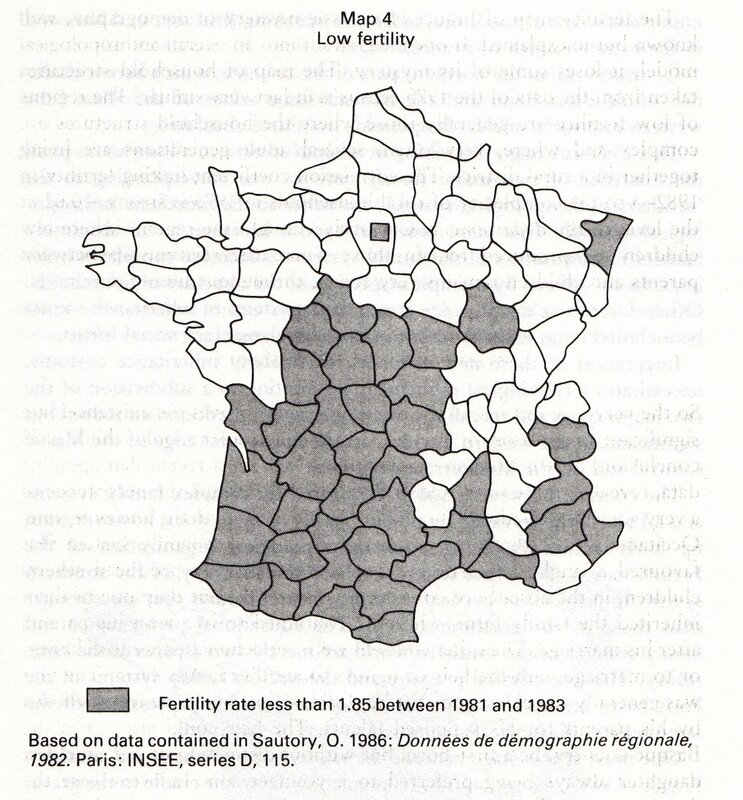 And the patterns created by these causal processes are very persistent; so the southern belt of high-literacy départements of the twelfth century coincides almost exactly with the pattern of high incidence of baccalauréats and doctors in the late twentieth century. The link between family and agrarian system will help us to understand why dechristianization gained ground, from 1791 onwards, in regions of large farms and share-cropping, and met with resistance in provinces where tenant farming and peasant proprietorship were predominant. This proposition can, moreover, be reformulated thanks to equivalences between family types and agrarian systems. Dechristianization spread in regions where the family structure was egalitarian nuclear or community, but failed in provinces where the family was stem or absolute nuclear. In other words — an explanation of ideology and religion in terms of a set of demographic and social characteristics that are distributed differentially across regions. I haven’t touched on the dynamics of politics at all here, which is an important piece of Todd’s work. But these comments suffice to illustrate the pattern of historical thinking represented by Todd’s work. It is striking for its effort to cross genres, incorporating geography, anthropology, and sociology into the formation of large interpretations of French history. And it is striking for the scale of the canvas that he attempts to paint.